The dollar store is probably the last place you would think to look for real food, but I recently took a trip to see what they had to offer and I was honestly surprised. Hidden in-between the rows of sugary processed foods were a few staple items that you might be interested to know about. Before I get to the list, I want to say not everything from the dollar store is a good deal. A few of these items are actually cheaper elsewhere so always check the size and quantity to make sure you’re paying a good price. Obviously, you shouldn’t be basing your entire diet around the dollar store, but if you’re in a pinch or don’t have any other stores available to you then it’s good to know they have some options! Do you buy any of your food items from the dollar store? I’d love to know! I'm so glad that this list has been a help! Have a great day! We always buy our tea and nuts from the dollar store. You can usually get a box of 100-count tea bags for $1 and that's a major savings for as much iced tea as we make. Nuts are outrageous at the grocery--but I can usually find a very nice brand of cashews for anywhere from $3.75 to $4.50. Spices are sometimes 2 for $1 and I was amazed to be able to fine REAL vanilla extract--not imitation. Once you get over the "stigma" you can do quite of bit of food shopping at the dollar store! I agree, nuts are really expensive! Thank you for sharing! If your dollar store takes coupons you should look for coupons for tea. I got a box of 100 teabags for a penny a few months ago. It's been a while since I've been to Dollar Store but as it happens I just ran out of oatmeal! I'm gonna go have a look. I have sometimes found spices at the dollar store for cheaper. Otherwise, Aldis has pretty much spoiled me. Aldi's prices are so much cheaper that it makes a dollar store look expensive! We do not have one near us, but thankfully my husband works near one and can stop and pick up things on his way home from work. I love this post! The Dollar Tree is one of my favorite places but I never really considered food. Thanks! Thanks for the list! I usually don't shop at the Dollar store because it's out of my way, but this will be good to keep in the back of my mind. I'm stopping by from the Living Well Spending Less blog link up. I always stop at the dollar store before I go to the grocery store. I buy spices, snacks, toothpaste, dish detergent and anything I can get cheaper then at the store. We are living on social security and with couponing, sales and the dollar store we spend $50.00 a week for groceries. I keep a well stocked freezer and pantry and something goes on sale I stock up! Sounds like you are doing great! 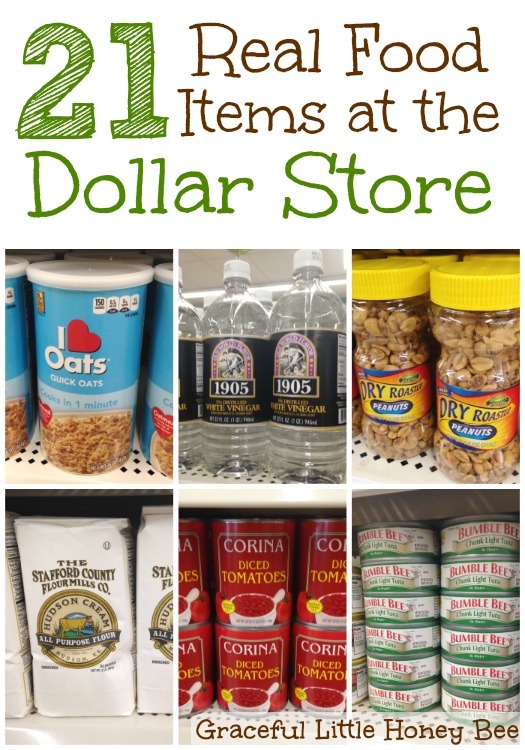 The dollar store is a good place to help you stay within your budget! I love the dollar store for food, cleaning products, toiletries and even paper goods. I noticed that my dollar tree sells a 4 pack (and sometimes a 6 pack) of tp and it lasts us just as long as the one ply we usually get at the grocery store. Plus, our local dollar tree accepts coupons too. I always check the couponing sites whenever I plan on going there, just in case there is a really great deal. Some even sell the Sunday paper for a dollar, I just can't handle the lines (or getting up early enough) to snag these anymore! I agree, you can get some good deals on a lot of stuff from the dollar store. I love to get party supplies, greeting cards and wrapping paper! I agree, I never buy bottled water, but I thought I would include it to show people what is available. Also, freezing your grains is a great tip that I don't think a lot of people know about. A dollar store just opened 3 doors down from my husbands pawnshop. It is beyond exciting! We have no dollar stores out here.... Until now. I will be stopping in tomorrow. Can't wait to see if there's a freezer section - that would be cool. I'll be looking to see if our dollar store carries anything organic. That would be awesome. I recently learned that the local Dollar Tree (where everything actually is a dollar or less) carries 3-4 varieties of Natures Own bread. It is fresh just like what you get at the regular grocery store and previously we were paying around $2.50 a loaf at Walmart. I don't go there often but from now on when I do I plan to buy several loaves and stick them in the freezer! Yes, my Dollar Tree carries it as well! What an amazing and authentic post. Believe it or not, I actually used this post in one of my curations! I love it because when people think of the " Dollar Store" the thought of real food never comes to mind. I regularly by the following at Dollar Tree: 12 pack flavored seltzer, Goya cookies, spices, mustard, ketchup, flour tortillas, 24 oz pkgs pasta, lasagna noodles, 8 ct med eggs, fzn pot stickers, fzn fruit/veg, boxed low sodium stock, boxed milk (emergency shelf), fun size chocolate bars, jars of peanuts, refried beans 24 oz can,brown rice, baked and pork beans, cake mixes, spices. I also get soap, body wash, shampoo, rubbing alcohol, peroxide, swabs, dish washing liquid 50 oz, boxed dish washer powder, generic brillo pads, nylon scrubbis, foil trays, tissues, wrapping supplies/cards, desk/home office supplies, cleaning rubber gloves, tall canisters Comet, LA's amazing orange cleaner 2 qts for laundry stains, dehumififying bags/tubs, waxed paper. I price book and know my prices well. Aldi's is right next door-the main source of my groceries. A word of caution is to compare weights/contents for example DT sells 12 oz not 16 oz bags of dried beans. Do you have your pricebook digitally? Or a blog post?? I love the Dollar Tree. I like to get salsa and popcorn there. I always leave with a bunch of other stuff, too! I buy my paper towels, toilet paper, tissues, and napkins at dollar general. Good quality too!! I also bought a laundry basket for $4 at the dollar store once. There spices are also reasonable. Our Aldi's beats most of the prices of these items at the Dollar Store except: Vinegar and Bread. We buy 100% Whole Grain Nature's Own at our Dollar Store (I would add this to your list), and Vinegar per ounce is cheaper at the Dollar Store than anywhere else I can find. I would also add Hunt's spaghetti sauce and Barilla's boxed spaghetti (both name brands, but Aldi's is still less than $1). We have found Sam's brand of water beats any other pricing per bottle anywhere, even when on sale. In most cases on the items on your list we are talking about $.10-.20 cents cheaper per item, but the savings do add up when you only have dollars to spend. Hope this helps. I appreciate your postings and have signed up for your newsletters. Dollar Tree happens ro be my all time favorite store! Plus you can use coupons there as well and buy in bulk on the website. This year has been especially hard on my family and we have had to pinch pennies constantly, I found that buying staplea from the Dollar Tree and using the pick five meats from Piggly Wiggly I have been feeding a family of four for around 35 dollars a week give or take a few dollars. I also have some deoression recipes my gramma taught me that are extremely cheap and very delicious if you would like for me to share them. One such is tomato gravy and rice, it costs under 3 dollars to make feeda the entire family. I love your blog by the way, I have been looking all over it for a couple of hours now, good job! Thanks so much for sharing Amanda! I didn't realize you could buy food in bulk on their website. Good to know! We stay in budget hotels when we travel and buy cleaning products and snacks at Dollar Tree the stores are everywhere! If the room cleaning isn't up to our standards we clean it ourselves and pocket the money! Also my Dollar Tree takes coupons they also have real bacon bits and great fried onion rings to put on top of green bean cassorole, they taste just like the name brand.